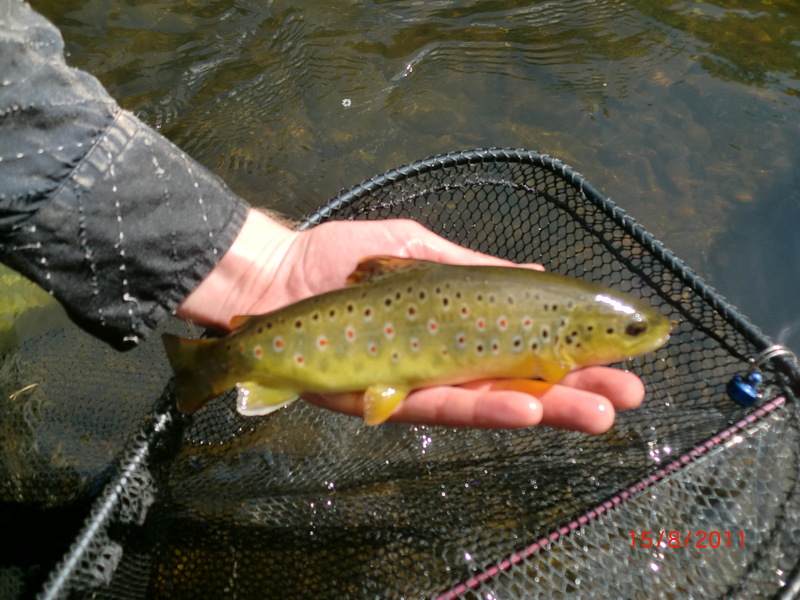 This tale is another example of how forums, or at least, Fly Fishing Forums, can work. After a number of attempts at identifying a likely stream in this industrial area, I connected with thetrouttickler, who introduced me to the River Cole, because in December 2010, he was one of three local anglers who worked with the WTT, for whom Paul Gaskell conducted a Site Visit and wrote up his findings in a fascinating report which he, Justin, shared with me. It was known that the odd trout had been caught from the Cole, and Paul’s report directed me to where it was more likely that I might. Both Justin, and his companion angler, Steve Williams offered to accompany me, which was comforting because both warned me that the river flows through a less than desirable part of the country, “The Cole can otherwise flow through some pretty built up and dodgy urban areas”….he wrote, and I should take note that in such a deprived area, Tonka, certainly would attract attention! As, I imagine might a wadered individual…. So when I received a further email from thetrouttickler, which told me with some excitement that there might be another option, it was here, where I began to focus. The Blythe is a lowland river in the Midlands which runs from Warwickshire, through the borough of Solihull and on to Coleshill. It runs along the Meriden Gap in the Midlands Plateau, is fed by the River Cole and is a tributary of the Tame, and it joins the Trent on its way to the North Sea at Humberside. 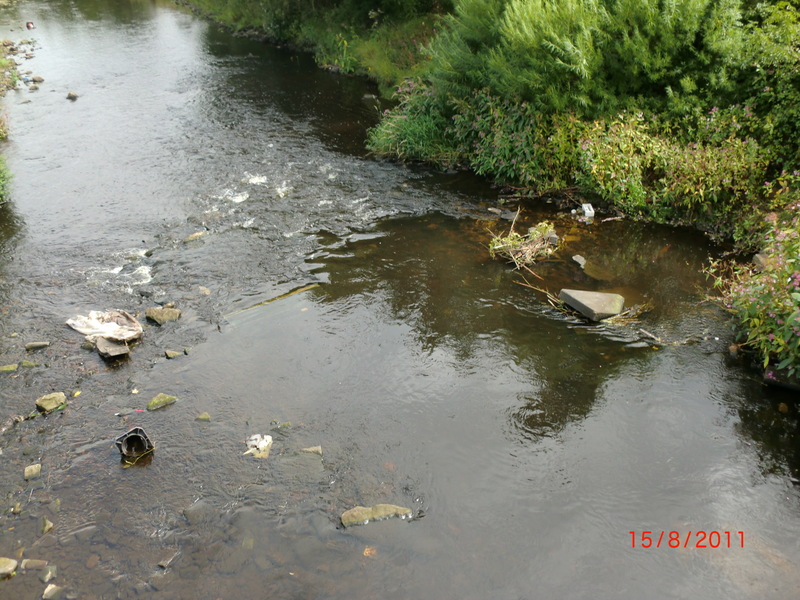 It is considered to be one of the cleanest rivers in England. 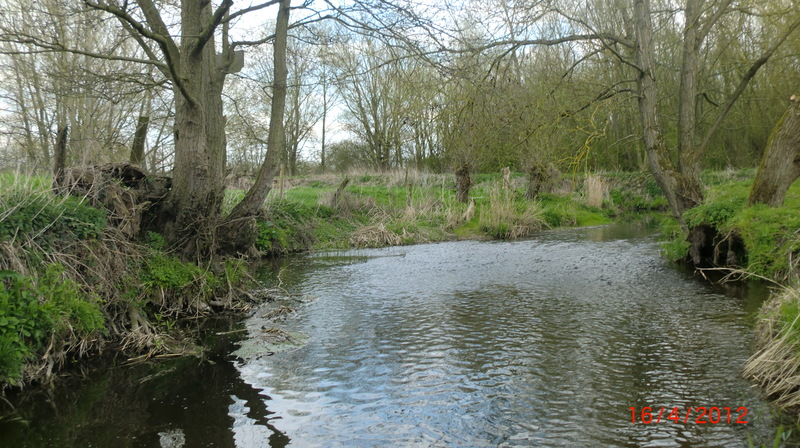 Running over clay, it is not a typical trout stream, and is known to hold a good head of tench, bream, rudd and barbel. On arrival, I met the truly helpful, Nigel Harrhy. He advised that few fished the river. Also, that the beat upstream, leased to West Midlands Police, was stocked, as was the beat downstream, adjacent to the fabled Forest of Arden Golf Club, so why, he argued would some trout not migrate into his beat, which he does not stock. And that he could not remember trout being caught, or at least for a while! But I was there, so I had to try! And with a modestly priced day ticket, I was about to, with only similarly modest expectations, after my chat with Nigel. A walk to the bottom of the beat showed a gravelly run, and I optimistically tied on an Adams and began casting, but into a downstream wind which made presentation hard and often the fly landed my side of the fly line! But I sensed, nor saw any fish of any description, so walked upstream. Entering the water at the end of runs and casting into them I spooked a couple of fish which may have been chub, and amused some carp anglers on the adjacent Barston Lakes who told me there were no fish in the river anyway, but generously wished me “Tight lines , Mate” and went back to kneading boilies (or whatever they do!). The weather was deteriorating a little, as I spied a likely run. Only two or three casts later, a tug , a pull, a short struggle and a fish into the net…a chub of about ¾ lb. But still, I wondered, might there be what I am seeking in the same spot!? So I cast a few more times, getting as close to the roots, as a growing wind would allow…until ‘Bang!’ and a take of an altogether, much more aggressive type. This chap did not fight like a brown, though, no waggling of the head, rather, and whatever it was, it torpedoed down the pool towards and past me, and headed to some roots. Leaning my rod to my left to apply a lot of side strain to keep him from the woody comfort, the 7ft, 4wt. Loomis bent alarmingly, more from my determination to get the fellow than his size, and when he came to the surface, I smiled a rainbow smile, as I realised I had another ‘county’ and a fish of about 2lbs. Two more fish, small dace, and the weather which was ‘threatening’ all afternoon, finally collapsed, and the rains returned, for which I was pleased. Eight to go, and Tonka, intact! A founder member of the Wild Trout Society, I remain a devotee in its, now, more tax efficient charitable status as the Wild Trout Trust, and bid for several lots in this year’s auction. But a note to Paul enquiring whether I could parlay his guiding in the South Riding, to some time in West Yorkshire, produced a positive response for which I was grateful, and entirely, it seemed, within the spirit of how we fly fishers behave. Paul is one the small full time team of five (now, six) which does the work of which we are all proud, and testified to, by the enormous sum which was generated from members in this year’s Auction, and was of the order of £50000. He, is a passionate outdoorsman and intellect, and the WTT, and therefore, we too as members , are lucky to have him. A PhD, and father to a handsome young son with his PhD-ed partner , he/they (and their energetic greyhound!) 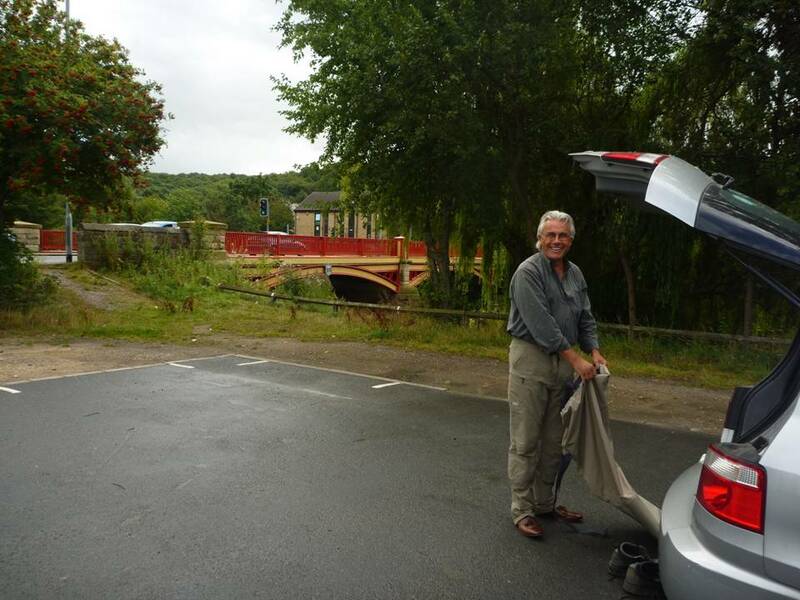 live a lovely life together, and I wish them happiness…he is great company, and our chatting during the ride to Huddersfield was illuminated by his love for his work and his care for the environment. Some conversations of this type can veer toward the negative, the concern voiced in dire terms…but his tone was positive, but realistic, and constructive…he is a ‘builder’, and I was energised by his enthusiasm. 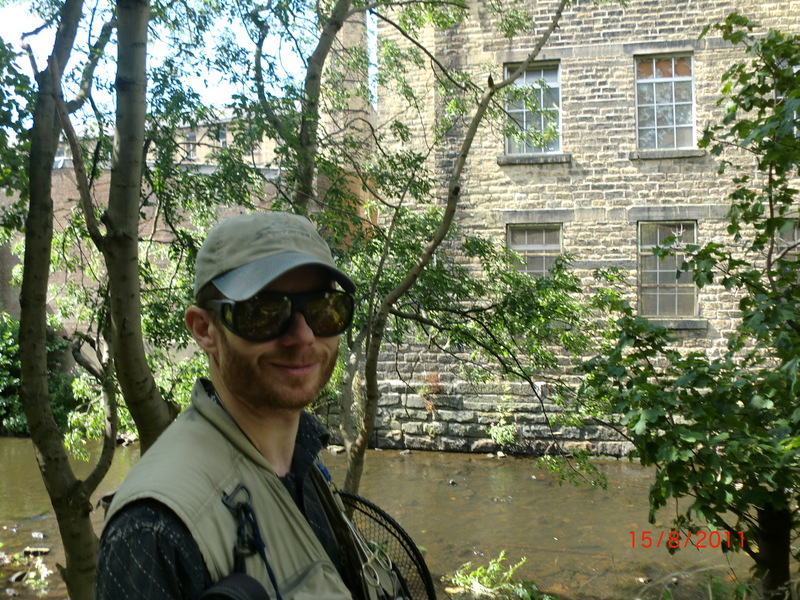 August 2011 – the Colne, then the Holme. My ‘quest’ has taken me to lovely places. I have discovered that wild trout can be found throughout England. 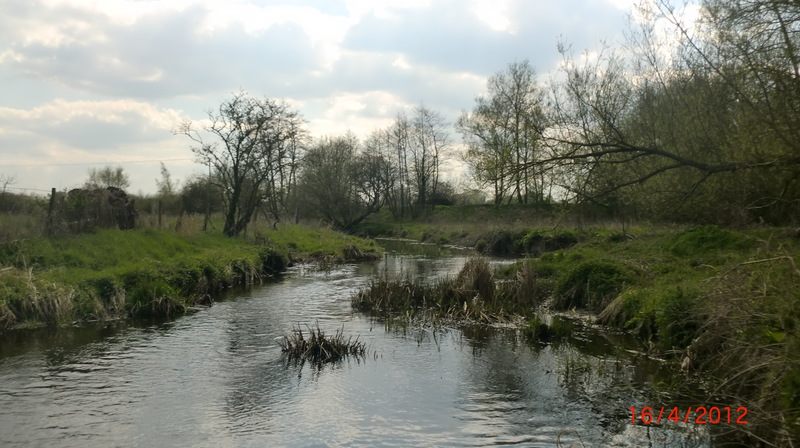 Many of my days have been spent in tiny rural streams, and there are more trout in these, because there are more of them, than in the rivers which are written up in the fishing press, which one imagines are because these are more easily accessed. Overlooked, are the streams which flow through busy places. And I understand this. We fishers enjoy solitude, for all the benefits which counterbalance our busy lives. 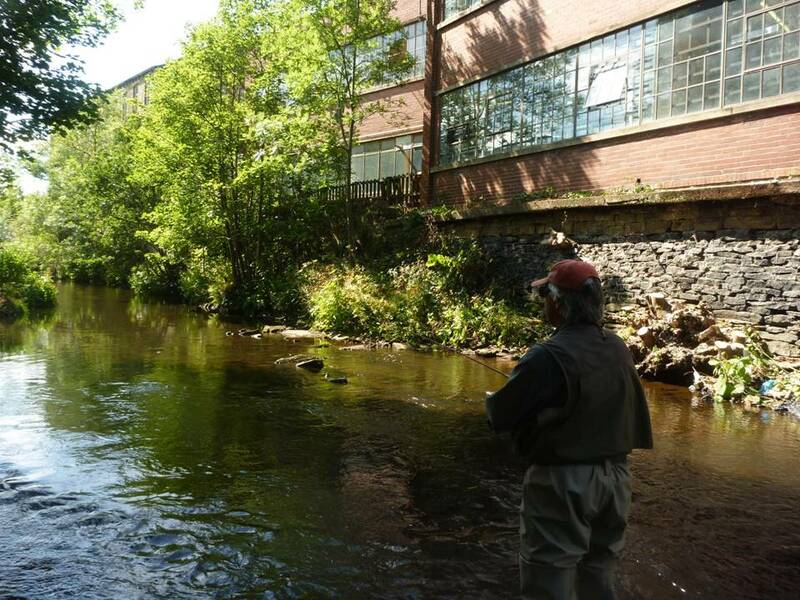 So who wants to fish in sight of a bus garage, anyway? 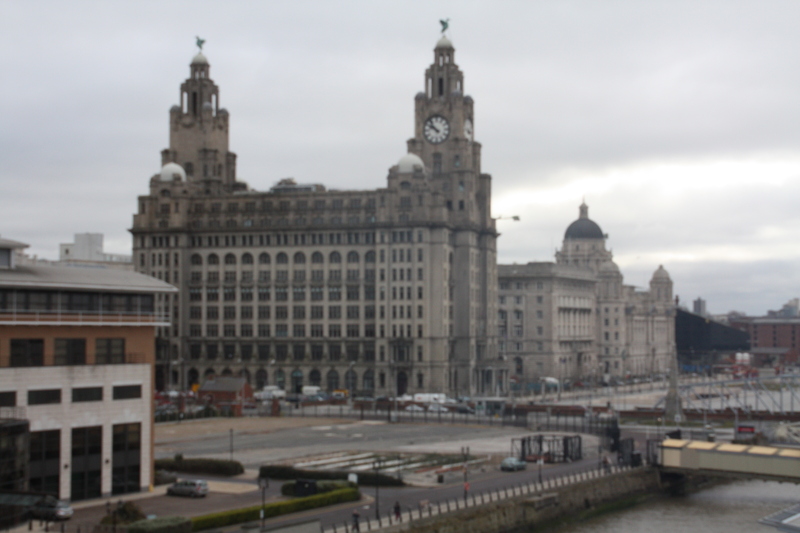 [see Greater London!] But…and this closes the loop, so to speak, as to why the WTT focuses its education programmes in towns where it can, hopefully, influence more effectively, at least as far as numbers are concerned. Whatever my first thoughts about the river flowing through Huddersfield were, after observing the obligatory traffic cone or two, I was thrilled to see the spreading rings of rising fish. And in the heat of an August afternoon, and in its brightness, I knew with Paul’s thoughtful guiding, it should be possible to net another county. 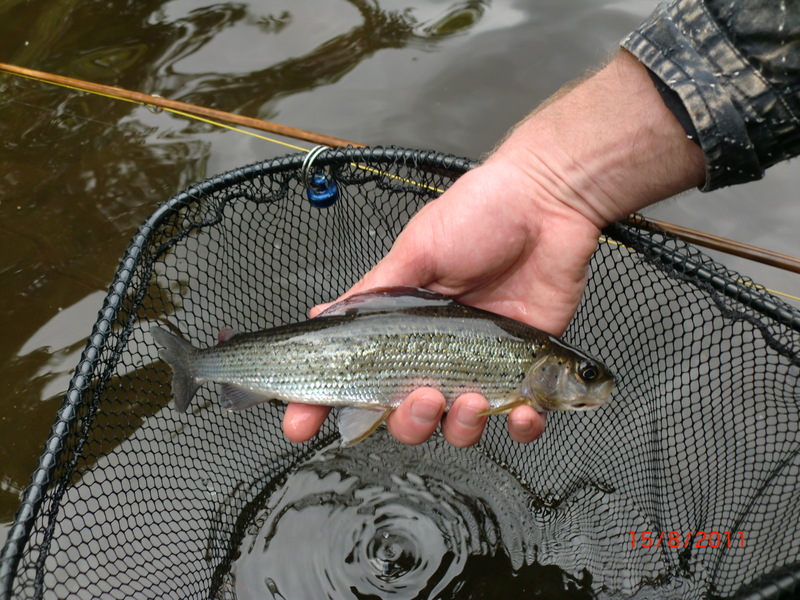 And if my first fish, caught on his rod, rigged with two weighted nymphs, cast to run along a fast run only a couple of feet deep, produced snags and misses then a grayling, I registered the key point about the grayling need for good water! So whilst traffic cones are artistically disgusting in trout streams, presumably they are not contaminants! 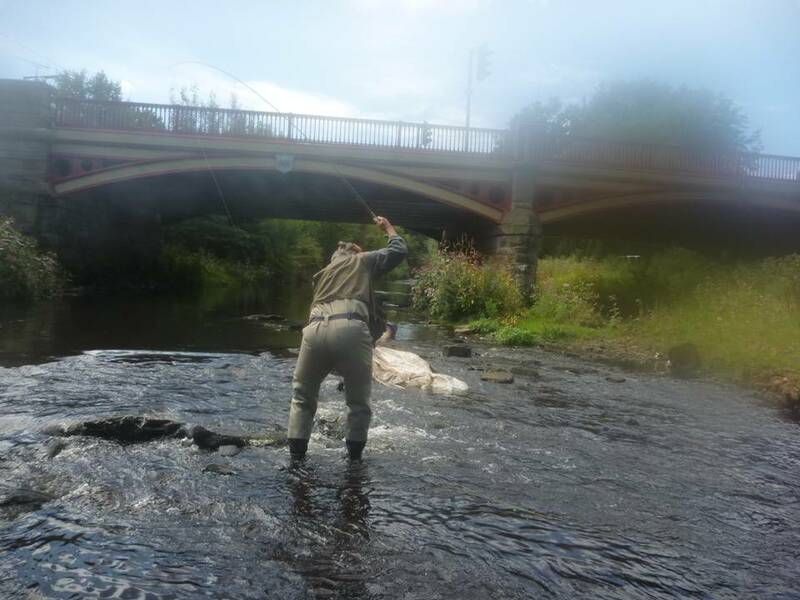 A wade back to the town bridge, under which we had seen a golloping rise earlier, produced, after just two casts, a lovely trout of ten ounces or so, to a CdC olive. Forget the ‘county’, or rather my ‘netting’ of another…this trout was a tribute to cleanliness, and to the efforts of all those who believe in restoration of our wonderful waters. And especially to Beth Allcock and her team at Greenstreams who have achieved so much in improving the Huddersfield rivers. and, together, caught half a dozen or so wild trout, and right up to Bridge Street, and even if the felt sole of my left wading boot did fall off, (and all credit and thanks to Orvis for replacing them very quickly! )my memories of a lovely afternoon with Paul, live on. For me four trout from urban streams…all of them on dry fly. The rather pale worm on a hook at the end of a static line tied to a stick wedged between rocks sometime ago, opposite an old mill…just reminded me…I am not sure, of what. But this is an urban stream!